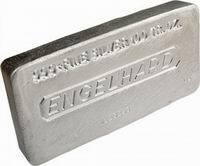 We offer Engelhard as well as Johnson Matthey 100 oz. Silver Bars 100 oz. silver bars offer an important investment advantage: they carry a low premium over spot silver. 100-ounce silver bars are an industrial product intended foremost as a storage means, and recognized around the world as a trading medium. They are therefore very liquid.